The great thing about this dish is that, like all spicy casseroles, it actually benefits from being made the day before and reheated, making it perfect for entertaining. Place the apricots in a bowl and cover with 150ml boiling water. Leave to soak for 2 hours. Preheat the oven to 180°C, gas mark 4. Heat 2 tbsp of the olive oil in a flameproof casserole over a high heat. Brown the lamb in batches then set aside. Add the remaining oil and the onion and cook gently for 10 minutes until soft and golden. Add the garlic and spices and cook for a further 2 minutes then return the lamb to the casserole. Add the apricots and their soaking liquid, the canned tomatoes and stock. Stir in the saffron, ground almonds, and some seasoning. Heat to simmering point, cover and cook in the oven for 1 hour. Add the courgettes, squash, tomatoes and harissa with a little extra water if necessary and cook in the oven for a further 45 minutes. 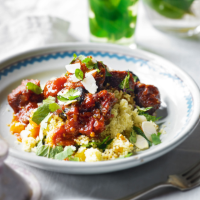 Season to taste adding extra harissa if desired, then scatter over the parsley or mint and serve with couscous. The couscous can be prepared in advance. Before serving, dot with butter, cover and reheat in the oven or in a microwave. The tagine can be frozen for up to 3 months. Defrost fully and reheat thoroughly before serving.